Paralympic athlete Michelle Konkoly shares her Sweat Diary. 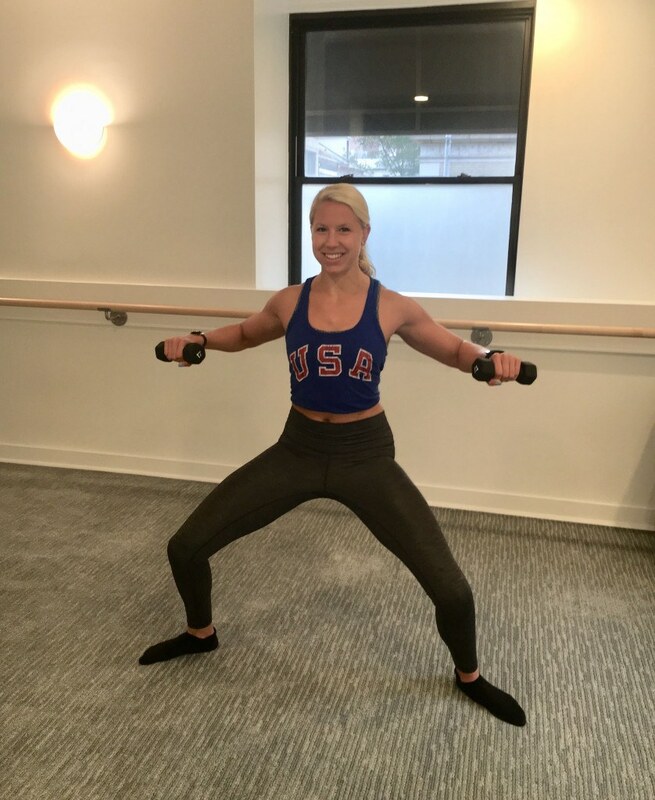 By Caroline Cunningham·	 11/29/2018, 8:00 a.m.
A class at The Bar Method. Photograph courtesy Michelle Konkoly. What role healthy living plays in my life: Healthy living means taking care of my body by buying, preparing, and eating nourishing foods; getting plenty of sleep; and keeping my body strong, flexible, and conditioned by doing a diverse array of exercises. In 2011, I suffered a traumatic spinal cord injury that left me with a spine and heel fusion, and permanent weakness in my legs. Since my injury, I have learned never to take anything my body can do for granted — I had to start from scratch to learn to walk again, and lost 30 pounds of muscle during my recovery. After re-learning how to walk, I got involved in the Paralympics and won two gold, one silver, and one bronze medal in sprint freestyle swimming events at the 2016 Rio de Janeiro Paralympics! I’m proud of my muscle because I know how far I had to come to get where I am today. Now, I’m focusing primarily on school, but I still go to swim meets when I can. Health memberships: I purchased the “New Client Special” at Bar Method Rittenhouse, which 30 days unlimited for $99. I also have a membership at the Jefferson Recreation & Fitness Center, which was included with tuition. Michelle Konkoly trains in the Jefferson pool. Photograph courtesy Michelle Konkoly. 7:10 a.m. — Alarm goes off, and I wake up and am out the door within five minutes to head to the pool at Jefferson. Fortunately, it’s only a three-minute walk! 7:30 a.m. — Swim at the Jefferson pool. It’s a 20-yard pool, which is shorter than most pools, but we make it work! One of my classmates swims with me and we do a tough 4000 yard aerobic workout. I swim faster than when we did the set last week so I am pumped! 8:45 a.m. — Showered, I walk back home and take my corgi, Ollie, out for a walk. 9:40 a.m. — Walk back to Jefferson’s campus for class and stop at dry cleaners on the way. 10 a.m. — Small group class. I eat my breakfast of papaya, pineapple, Greek yogurt, and chia seeds with a homemade latte (two shots and soymilk). Someone brought in Isgro’s cannolis so I have to eat half of a cannoli as well! 11 a.m. — Facilitate a group for the first year medical students, and have another cup of coffee. Swimming in the morning makes you a special kind of tired. 12 p.m. — Walk to the University Health Center to get the PPD shot I need for volunteering. While I’m waiting, I snack on two leftover paleo chocolate chip cookies I made over the weekend. 2 p.m. — I finally get home, and eat lunch of a kale salad with avocado, carrots, tomatoes, and homemade carrot ginger dressing, plus slice of whole grain bread and some chocolate-covered almonds. 3 p.m. — I head to the Jefferson Library to overview the material for the week. I have three clementines and half a bottle of kombucha I got from the new Sprouts Market last week. 5:45 p.m. — I get home and walk Ollie to Washington Square Park. I finish an almost-empty bag of Skinny Pop kettle corn before I head to barre. 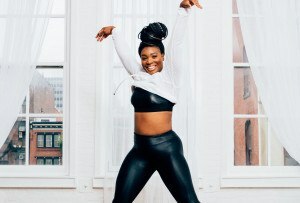 6:45 p.m. — Barre class at Bar Method Rittenhouse. 8 p.m. — Barre doesn’t make me nearly as hungry as swimming, but I’m still excited for my dinner that I prepped yesterday: sushi bowls! I top some sushi rice with calamari salad my roommate didn’t want, plus some broccoli, edamame, pickled ginger, and nori strips. I also have some almonds and dates. 9 p.m. — Ok, the hunger caught up with me. I go a little overboard on after dinner snacks tonight and have a sundae of tahini squares with an Enlightened fudgesicle, half a banana and coconut whip, and a slice of chocolate pumpkin bread. I went on a baking spree over the weekend and now have all these goodies sitting around tempting me. 10:30 p.m. — Finish studying and head to bed. Weight lifting to work on fast-twitch muscles. Photograph courtesy Michelle Konkoly. 8:14 a.m. — Woke up without an alarm. I try to give myself one day a week to sleep in. Once out of bed, I take Ollie for a walk and then eat half a banana and half a slice of chocolate pumpkin bread. 9:15 a.m. — At the Jefferson gym, and I do a one-hour lift, focusing on upper body explosiveness. I have a swim meet coming up in December, and since I swim sprint freestyle, power and fast-twitch muscle work is so important! 10:30 a.m. — Come home, shower, and make a latte to drink as I listen to this morning’s recorded lectures. A smoothie bowl for lunch. Photograph courtesy Michelle Konkoly. 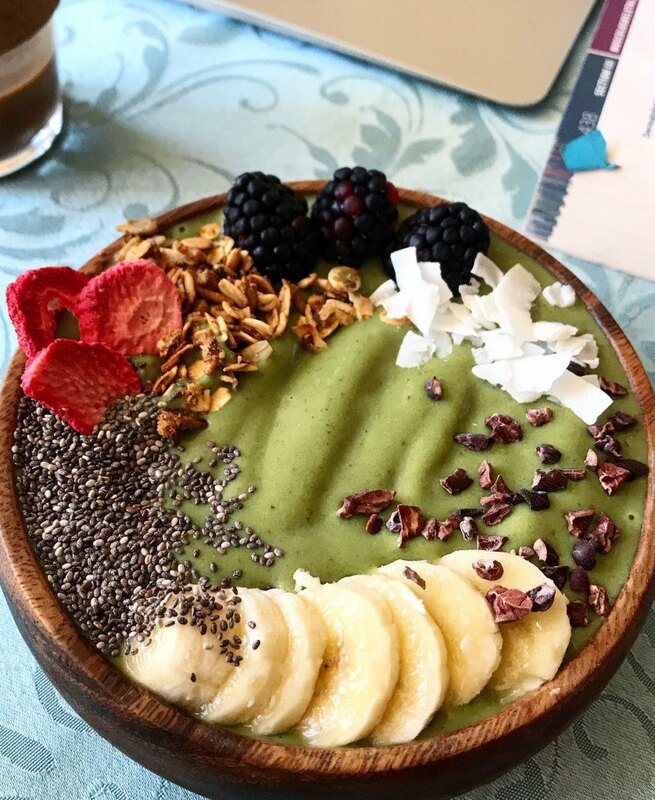 12:15 p.m. – Make a smoothie bowl for lunch! I’m obsessed with my Vitamix blender. I make a smoothie out of frozen bananas, peaches, and spinach, almond milk, and Orgain vegan peanut butter protein powder, topped with homemade granola, cacao nibs, chia seeds, coconut, and fruit. I finish off lunch with some chocolate covered almonds and salted almonds. 1 p.m. — I spend most of the afternoon continuing to work though this morning’s lecture material on dermatology. I walk into to Walgreens as a study break and buy tweezers and a pack of gum ($5.20). 2:45 p.m. — Finish the Sprouts kombucha, along with some more tahini bars (they’re so good!) and some fresh pineapple. 5 p.m. — I get ready for a Jefferson Gala event tonight at the Philadelphia 201 Hotel. I Uber over with some friends and the venue is gorgeous! Cake for dessert. Photograph courtesy Michelle Konkoly. 6 p.m. — At the reception, I have three pieces sushi and a glass of Champagne. For dinner, we’re served bread and salad, and I request the vegetarian entrée of risotto, carrots, and broccoli rabe. I’m not strictly vegetarian, but try to eat less meat whenever possible! 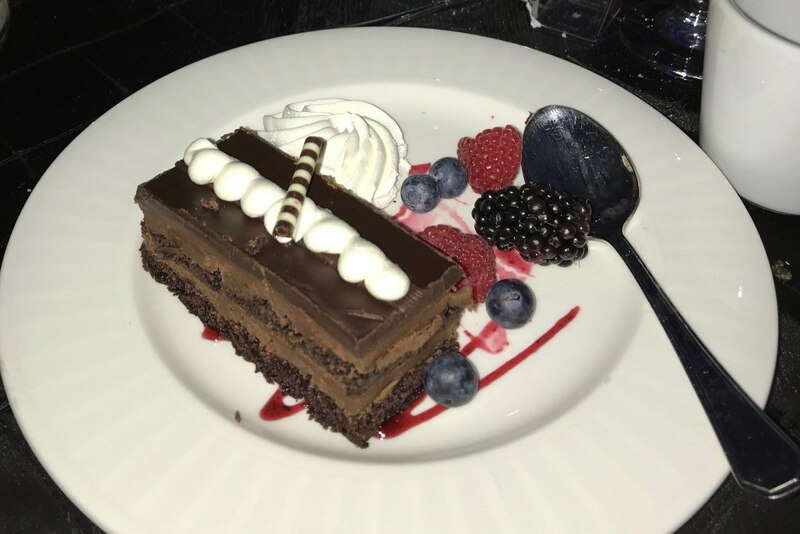 Dessert is a beautiful chocolate mousse cake with fresh berries. 9:30 p.m. — Uber back home and walk the dog. I’m craving something crunchy, so I grab a few handfuls of Special K out of the box before getting into bed. 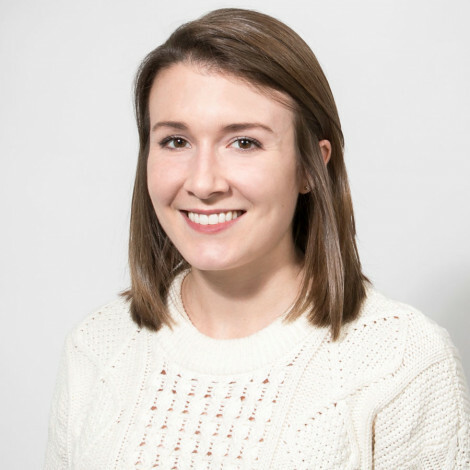 Michelle Konkoly has an unlimited membership at The Bar Method. Photograph courtesy Michelle Konkoly. 7:10 a.m. — Alarm goes off and I’m off to the pool. 7:30 a.m. — Swim a 3200-yard workout by myself. Today I used parachutes that are tied to my waist to add extra resistance. It’s tough but really helps me increase my sprint speed and power. I shower at the pool and then come home to walk Ollie. 10 a.m. — Grab my backpack and head to class. I eat my yogurt with fruit and chia seeds and a latte — I make this breakfast the night before so I can just grab it and go. 12 p.m. — Class ends and I come home. I’ll never get over how hungry swimming makes me in comparison to other workouts! I grab a couple almonds and pieces of caramel corn before taking Ollie out. 12:45 p.m. — Lunch is a bowl of kale, sushi rice, tofu, carrots, broccoli, and pickled ginger, plus a bit of spicy mayo on top! I also have an apple from when I went apple picking with my mom and sister last week. 2 p.m. — I head to the library and have three clementines as a snack. 3 p.m. — Every Wednesday we have “Cookie Hour” with the applicants interviewing at Jefferson. Current students can come to mingle and of course grab a cookie! Today they have strawberries and mini cheesecakes too, so during my break from the library I head over and have one of each! 5 p.m. — Come back home and have a snack before walking Ollie: a small bowl of Special K with cashew milk and freeze-dried strawberries and almonds. 6:45 p.m. — Barre at The Bar Method. It’s been fun to have the flexibility to try new workouts, rather than having to focus 100% on swimming, like I was during the time leading up to Rio. Homemade sushi for dinner. Photograph courtesy Michelle Konkoly. 8 p.m. — Finally time for dinner! 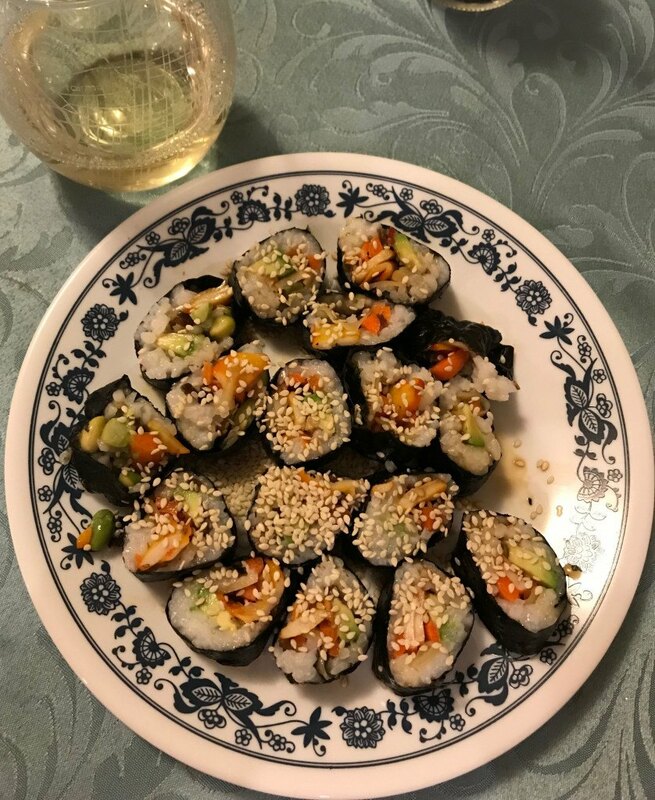 I use my sushi bowl meal prep ingredients to make two homemade rolls and have a glass of wine with them. 9 p.m. — As I’m sending emails and studying, I make a bag of light natural popcorn and mix in a few pieces of caramel corn. 10 p.m. — We still have Halloween candy lying around, so I have a couple pieces (Reese’s are my favorite!) before walking Ollie and heading to bed. Enlightened ice cream from Sprouts. Photograph courtesy Michelle Konkoly. 7:10 a.m. — Alarm goes off and I snoozed it for eight minutes. I almost never hit snooze, but I knew no one was joining me for my swim this morning, so I wouldn’t be holding anyone up if I was a few minutes late! 7:35 a.m. — Swim a 2,900-yard workout. It’s certainly on the shorter end, yardage wise, but today I used a bungee tether that attaches me to the wall so I can swim continuously against the resistance for the length of my 50 free race (about 30 seconds). It’s a great way to simulate an Olympic length (50m) pool in our 20 yard pool! The tether is no joke — my arms are always burning by the end! 9 a.m. — Showered and walked home, then walked Ollie. 9:35 a.m. — Made my favorite smoothie bowl again. 10 a.m. — Head back to campus for class, and drink my latte. One of my classmates brought in candy, so I have two mini Kit Kats. 12 p.m. — Come back home and have a piece of chocolate pumpkin bread with pumpkin butter while watching lectures. 12:30 p.m. — Eat half of a GIANT apple, plus a kati roll from Masala Kitchen — one of my friends had some extras after an event. 2:30 p.m. — Spend most of the afternoon studying at home, and eat the other half of the giant apple. 4:15 p.m. — Have a pre-dinner snack of bowl of Special K with half a banana, freeze dried strawberries, dates, golden raisins, and soy milk. I also have a cup of pineapple spirulina kombucha. 6:15 p.m. — I take Ollie on a long walk, then have dinner: a kale salad with the rest of my sushi rice, tofu, bit of edamame, and a quarter avocado, plus a bowl of defrosted frozen mangoes, strawberries, and pineapple with coconut flakes. 7 p.m. — I have another event for the first-year med students on campus, so I walk back over. For some reason there’s so much candy around this week! I have two mini packs of gummy worms as I catch up with my friends at the event. 8:30 p.m. — Come back home and have a true dessert: chocolate! 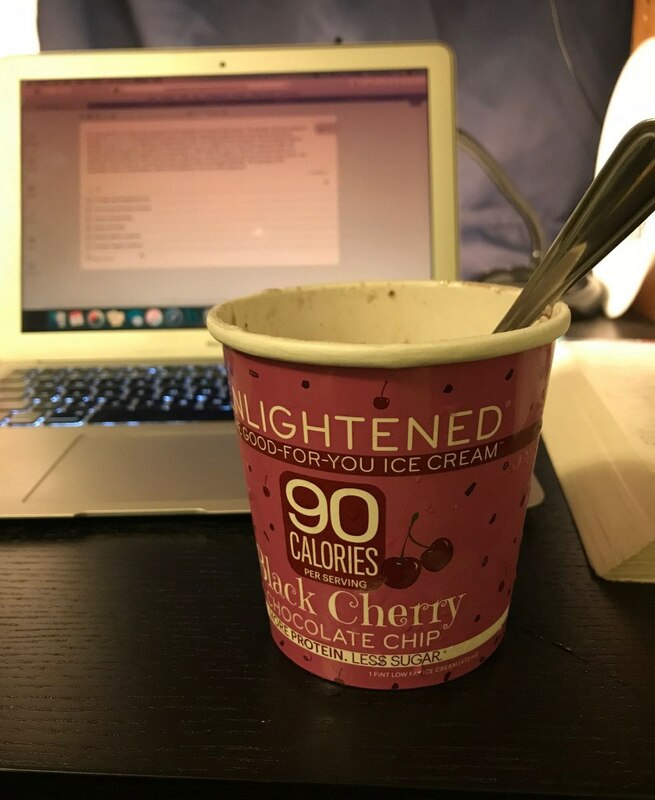 I love Enlightened ice cream, and found a new flavor — black cherry chocolate chip — at Sprouts last week. I eat the whole pint happily as I’m studying, along with a piece of chocolate and two more tahini squares. Spaghetti squash pasta for dinner. Photograph courtesy Michelle Konkoly. 6:38 a.m. — Alarm goes off and I grab a squeezable applesauce packet to eat on my walk to barre. 7 a.m. — Barre. It’s great to get my workout out of the way so early on Friday. 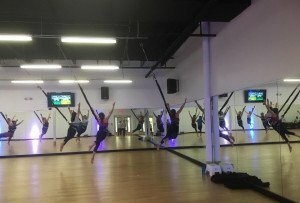 I always feel like my posture is so great after barre, too! 8 a.m. — I walk Ollie and make my smoothie bowl. Today I use up some frozen strawberries instead of peaches, and get in some last minute studying as I eat it. 9 a.m. — We have short quizzes every Friday — this week was all about various skin conditions. 10 a.m. — Head back home and have two and a half slices of chocolate pumpkin bread with pumpkin butter as I do some chores and cleaning in my apartment. 11:30 a.m. — I make a homemade iced latte, and have a ThinkThin protein bar and a mini Rice Krispie treat as I do laundry. I’m heading out of town for a wedding this weekend so I’m trying to get ahead on my normal weekend chores! 12:15 p.m. — I walk Ollie to Washington Square Park and call my dad to catch up as we walk. 1 p.m. — I get a pedicure and gel manicure in preparation for the wedding ($42 with a coupon). 2:30 p.m. — When I get back home, I have a little bit of leftover tofu with a quarter avocado, kale, and edamame, plus the rest of the pineapple spirulina kombucha. I also finish up the final crumbs of a container of homemade granola, mixed with cacao nibs and golden raisins. 4 p.m. — I spend the afternoon prepping my study schedule for our exam week next week, and have a tiny apple and half a container of Greek yogurt with cinnamon and chia seeds. 6:45 p.m. — I start making dinner, which is really meal prepping for next week! I have four little breadsticks and a bit of olive tapenade while I roast a spaghetti squash. 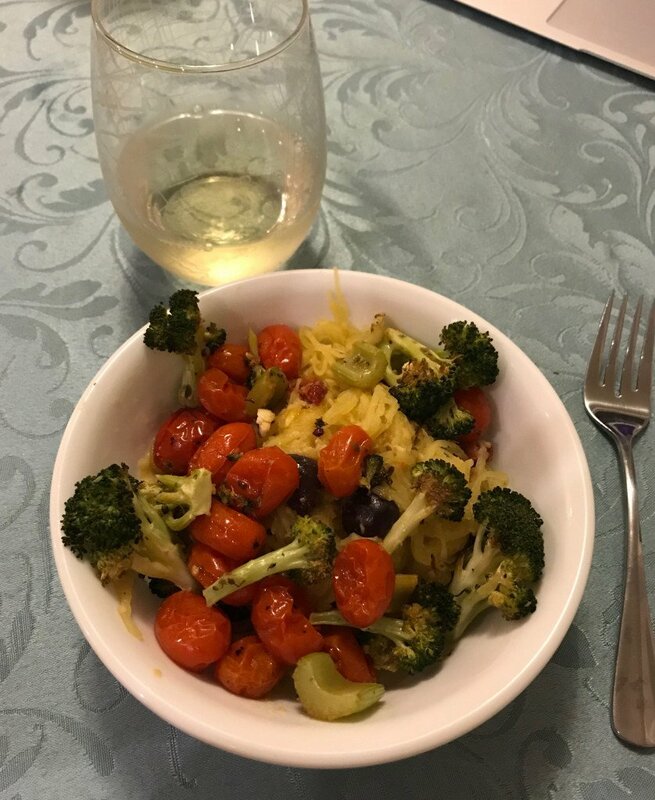 I make a chickpea/nutritional yeast “cheese sauce” for the squash, and mix it all together with some sun dried tomatoes and Kalamata olives. I also roast up some leftover veggies from a veggie tray. 7:30 p.m. — I pour myself a glass of white wine as I eat my spaghetti squash creation. The sauce turned out so creamy! 8:30 p.m. — My roommate offers me some of the red wine she brought back from Italy, so of course I have to try it. 9:30 p.m. — I finish up packing for the wedding and have an Enlightened fudgesicle and three pieces of candy for dessert. 10 p.m. — Bed! I have an early train to DC tomorrow, so I’m calling it a night!